A virtual switch is a logical network switch that operates at the hypervisor level. Network interface cards (NICs) are emulated into a single virtual switch. Some virtual switches do not have any physical interfaces or connectivity to physical networks. This type of virtual switch is used for virtual servers that do not need to connect to a physical network. Virtual switches connect to the physical network via physical NICs. A physical port that is used to connect a virtual switch to a physical network becomes an uplink port. A virtual switch is an emulated switch that is used to provide networking to virtual servers. They use their internal virtual ports to connect virtual servers to one another or to the hypervisors. Physical network interface cards (NICs) can be attached to virtual switches. The NICs are used by the virtual switches as uplink ports to connect to other virtual switches or physical switches. In Figure 1, Virtual Switches A and B each have eight virtual ports and several physical NICs. The virtual servers are connected to the virtual switches via virtual ports. 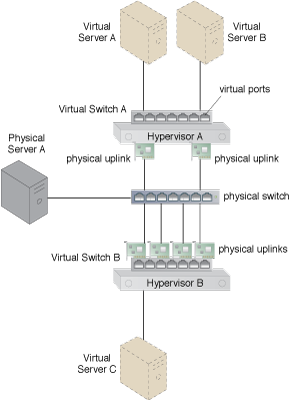 Communication between Virtual Servers A and B occurs at the virtual switch level. No traffic is sent to the physical NICs. If any of the virtual servers need to communicate with Physical Server A or Virtual Server C, the traffic needs to pass through the physical NICs and physical switch. Figure 1 – An example illustrating virtual switches. Virtual switches can have varying numbers of attached physical NICs. In Figure 1, Virtual Switch A has 2 physical uplinks. Virtual Switch B has 4 physical uplinks. Some virtual switches have only one physical uplink or none at all.